Skillful dribbling enables you to control a soccer ball’s movement so as to maintain the advantage over an opponent. The skill is used to do several things in a game, including outmaneuvering a defender, handling a ball in a tight space or moving forward at top speed on an open field. Various drills performed solo or with partners can help you to perfect your dribbling. 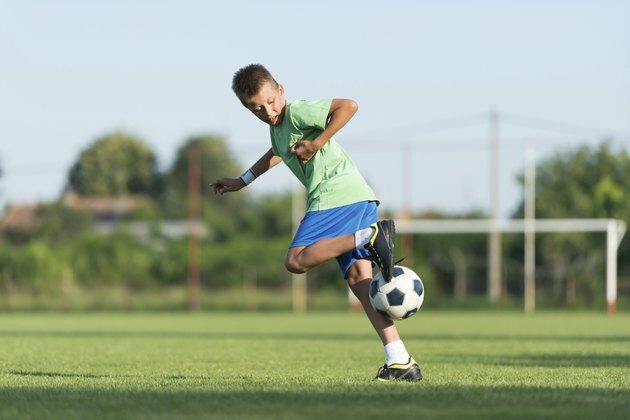 The more skilled you are at using different regions of your foot -- sole, instep, ball or outer edges – the more control you can exert over the ball while dribbling. Perform a drill in which you "dance" with a ball. For example, continuously tap or touch the top of the ball with the bottoms of your toes or the ball of your foot. Alternate your feet while tapping, making the ball roll in different directions. As you move, try and develop a rhythm. Extend your arms to the sides to maintain balance. To advance the drill, form patterns with the ball's movements, for example, a square, triangle or even your own initials. Perform drills that can help you to develop the kind of nimble dribbling that Lionel Messi of Argentina does to overtake his opponents. For example, pair up with another player after placing six to eight cones on a field and spacing them two yards apart in a line. While your partner jogs in place, begin at the first cone and dribble in and out of the cones in a zigzag pattern as fast as possible. When you finish the run, pass the ball to your partner. Continue taking turns until each of you completes 20 reps. If you knock down a cone, consider the fumble as an error. Score one point for each run performed without an error. To increase the difficulty, narrow the distance between the cones to one yard or arrange the cones in a random pattern. Work with a partner to hone your ability to shield the ball as well as dribble under pressure and head to open space. For example, create a 20-by-30-yard grid. On your own or with your coach’s call-out, try and keep possession of the ball while your partner attempts to steal it away from you. Envision a match of keep-away. If your partner manages to steal the ball or the ball moves out of bounds, reverse roles. Change your pace often and dribble towards open space to evade your partner. Play five to 10 rounds, each lasting for 30 seconds, and rest for 30 seconds in between each round. To boost the difficulty, extend the duration of a round to one minute. Speed dribbling is a key skill, enabling you to create an attacking advantage on the field. Partner with two other players to perform a speed drill, which is structured like a relay race. Have one player begin with you at the goal line while the third player stands on the edge of the 18-yard line, or penalty zone. Begin by dribbling as fast as possible to the third player on the 18-yard line. Pass the ball to the third player and remain in his spot. He should dribble back to the second player who is standing at the goal line. The second player then has to dribble the ball to the 18-yard line to finish the first cycle. Continue this cycle until all three of you have dribbled 20 lengths. If you lose control of the ball while dribbling or passing the ball to another player, count it as an error. For every length dribbled without an error, score one point. To raise the difficulty level, increase the distance of each leg of the race to 30 yards or boost the number of cycles you dribble.